Washington, DC (October 11, 2018) – Restaurant Association Metropolitan Washington (RAMW) along with its members are excited for the holiday season, and invite diners to book their next holiday party, special occasion dinner, corporate events, and so much more in expertly designed spaces that serve deliciously curated festive fare and cocktails to take the hassle out of planning. For a complete list of participating restaurants and exclusive specials, please visit www.ramw.org. Consistently awarded as one of the Best Wedding Vendors by Washingtonian Bride and Groom and frequently cited as Capitol Hill's Best Private Event Space, private dining at Charlie Palmer Steak offers award-winning Charlie Palmer cuisine with all-American wine selections. With panoramic views of the Capitol Building and the open expanses of the National Mall, events in Charlie Palmer’s unique spaces will make your event an affair to remember. With exclusive access to the building’s 9th floor and grand rooftop terrace, Charlie Palmer Steak is the dream location for a wedding with the best views in the District. RAMW Exclusive Offer: Celebrate the season at Charlie Palmer Steak’s DC location and enjoy 15% off all event bookings when you mention RAMW! Le DeSales is a festive venue for your holiday gathering located downtown, across from the historic Mayflower hotel. Group options include: 100 seated, 150 cocktail style, and semi-private settings. Contact Zoe@LeDeSales.com for more info or to reserve your date. Celebrate in style this holiday season at FIG & OLIVE DC with a variety of seating options available to offer diners the opportunity to create a range of personalized experiences! Their expansive 10,000 square-foot space accommodates up to 330 guests and encompasses a variety of seating options including the main floor lounge, bar, and outdoor terrace, as well as the upper level dining area and private dining room. These spaces offer diners the opportunity to create a range of personalized experiences from casual get-togethers at the bar and lounge, to intimate, private celebrations. Contact Event Sales Manager Jennifer Paik today! Come see the new look of Lebanese Taverna’s DC location with a contemporary feel in a refined setting with subtle touches of a Lebanese home. They’ve added seats to the bar and a new lounge too! Still great for groups of all sizes and the private room now seats 56 people. Located within walking distance of the Marriott Wardman Park and Omni Shoreham Hotels and directly across the street from the Woodley Park Metro station, their DC location is ideal for corporate and social events. Validated self-parking is also available in the garage directly behind the restaurant. The Cedar Room accommodates up to 60 people for a private seated event and 40 people for a standing reception. For smaller affairs, the room can be offered as a semi privately as well. The main dining room is also available for larger parties. Catering options also available! See website for details. Celebrate the season at José Andrés’ ThinkFoodLab! This unique venue is available for fully private events now through December 31. Select a menu featuring a curated assortment of bites and beverages from José’s award-winning restaurants to create a one-of-a-kind holiday experience. RAMW Exclusive Offer: Receive a $100 gift card for any event booked at ThinkFoodLab for 12 or more that takes place 12/17/2018-1/31/2019. For more information and to book your event, please contact Janice Conner at JaniceC@thinkfoodgroup.com. Shaw’s Tavern is the perfect place for your holiday celebration - from seated dinners, to cocktail parties, they have everything you need to make your event special! See website for details. Let Sette Osteria help you arrange your next special event such as birthdays, corporate affairs, holiday receptions, product launches, networking receptions and more. Their unique setting allows them to accommodate any type of event from intimate dinner party of 2, up to large receptions of 175 guests seven days a week for brunch, lunch, and dinner with customized menus, buffet or family style meals, with audio visual capabilities available as well. Contact mzorgani@setteosteria.com to inquire about your next event! LiLLiES Restaurant in Woodley Park offers the perfect venue for your private reception or dining affair. Located conveniently within walking distance of the Marriott Wardman Park and Omni Shoreham, they offer banquet rooms for corporate receptions as well as private dining rooms for small family groups - see website for private dining options and full catering service details. Join 801 Restaurant & Bar for your next event! With several floors available for your holiday party, birthday, or corporate event, their beautiful decor and friendly staff are ready to make your event a memorable experience! Complete the Online Event Request Form to begin customizing your food and beverage package details. Consider Cuba Libre Restaurant & Rum Bar for your next social or corporate event. Whether an intimate party of 15, a grand event for 500, a themed cocktail party or an elegant dinner. RAMW Exclusive Offer: Book your holiday party at Cuba Libre Restaurant & Rum Bar before October 31st to receive early booking incentives! All-Purpose Pizzeria offers riverfront private dining for holiday parties at the new Capitol Riverfront location and catering of pizzas, salads and Italian-American specialties - see website for details and contact them at riverfront@allpurposedc.com to book today! With everything from a heated rooftop to a cozy wine bar to a gorgeous beer hall/dining room, celebrate the holiday season at Roofers Union + Jug & Table for your next private event, with something to offer groups of 20 to 200 and everything in between! Click here for details and to fill out the event request form or contact them at jugandtable@roofersunion.com to book. 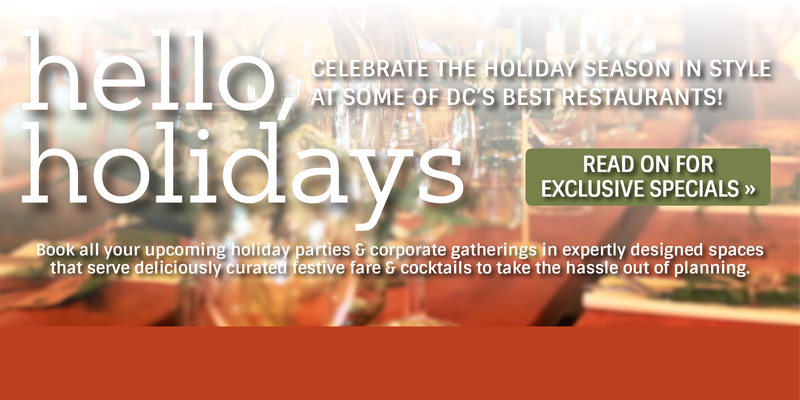 This holiday season discover Mess Hall, one of DC’s most dynamic event venues! Home to some of DC’s hottest emerging food entrepreneurs, it’s the only private event space in the city that looks into a beautiful open industrial kitchen with camera-ready equipment and high-tech amenities. Let your imagination run wild while choosing from a diverse list of food and beverage purveyors in-house to simplify your planning and enhance your guests’ experience with the assistance of their whole team that’s ready to help you host. RAMW Exclusive Offer: Book your event at Mess Hall by 10/26 and mention RAMW to receive 20% off your beverage package! Host your upcoming holiday events at Navy Yard’s Osteria Morini, the perfect space located in the Capitol Riverfront district to gather with family and friends while celebrating with a classic Northern Italian menu catered to fit your needs - see website for details. Choose from three, four and even five course menus, highlighting the flavors of the Emilia Romagna region – perfect to be served for the table, or with a selection per course for all guests. Contact the Altamarea Group events team for additional details or to set up a tour of the space at morinidcevents@altamareagroup.com. Whether you’re hosting an intimate dinner for family and friends, an office holiday lunch, or a large-scale holiday celebration, Convivial is the place to go for holiday cheer! Conveniently located two blocks from the Walter E. Washington Convention Center, they offer private dining options for breakfast, lunch, and dinner. Accommodations available for groups from 10-175 people - see website for details and book today. Click here to view details and book your event today! Celebrate the holidays with District Commons, where American cuisine and all its global influences with flair and originality. Whatever special occasion, their event designer will ensure that your party is exceptional. Click here for more details. RAMW Exclusive Offer: Book early for special rewards! Book your holiday event at District Commons before 10/31 and earn up to $500 cash back for your next event! Contact Darnell Howell at darnell@PassionFoodHospitality.com or (202)350-3084 to plan your next event. For all your private entertaining, the light and elegant interior of Acadiana offers a variety of flexible options. With semi-private to private and space for anywhere between 30-200 guests available paired with 3 or 4-course menus ranging from $40-$65/person, you can create your perfect event. Click here for details. RAMW Exclusive Offer: Book Early for Special Rewards! Book your holiday event at Acadiana before 10/31 and earn up to $500 cash back for your next event! Contact Darnell Howell at darnell@PassionFoodHospitality.com or (202)350-3084 to plan your next event. Whether it be a business dinner, family and friends gathering, birthday, holiday party, or wedding celebration, Mayahuel Cocina Mexicana will help you make it a FIESTA! Their Mexican fiesta platters of small Mexican bites and handcrafted cocktails with everything from Tequila to Mezcal will surely brighten your palette and your mood! Their team will work with you from beginning to end to create a style of event that best suits your needs. From a standing cocktail reception, to buffet, to an intimate coursed dinner, contact them to create your next event! Click here for more event information. Poca Madre offers multiple event spaces in a variety of settings, both private and semi-private. Work with their events team to create an unforgettable dining experience complete with Chef Victor Albisu’s refined, contemporary Mexican cuisine. Full restaurant buyouts also available – click here to book an event. Located in historic Georgetown, across the street from the Four Seasons Hotel, La Chaumière offers a relaxing French country atmosphere for your social or business functions. They offer 2 completely private dining rooms for 15-40 people. Select from one of 3 prefix menus, for $53, $63 or $78/person along with a great selection of wines to pair with. Click here for private dining details and book your party today! Celebrate the holidays with CIRCA at Chinatown! American restaurant featuring seasonal classics with Asian flare and the second floor Dragon Bar overlooking Chinatown. Located conveniently by the Capital One Arena, Walter E. Washington Convention Center, and Gallery Place Metro, their team will work with you to tailor the space and provide a special menu to meet all your needs – click here for details and start planning. RAMW Exclusive Offer: Book your event with CIRCA at Chinatown by 10/31 and receive a $100 gift card toward future purchase. Valid only at Chinatown location. Celebrate the holidays with CIRCA at Foggy Bottom featuring seasonal menus, an extensive beverage list, and patio nestled in bustling Foggy Bottom perfect for a private affair. Their team will work with you to tailor the space and provide a special menu to meet all your needs – click here for details and contact to book today! From cocktail parties to business meetings or catered parties, Ruth’s Chris Steakhouse’s dedicated events team brings a level of quality and service that only they are known for. From off-site catering to private dining, they’ve got you covered for all your upcoming holiday event needs. Click here for more information and start planning! RAMW Exclusive Offer: Book your event at Ruth’s Chris Steakhouse before 10/29 and receive $50 for every $500 spent on private dining or off-site catering! See website for details. This holiday season, The Grill from Ipanema is the perfect place for your special event whether a small or medium reception, business meeting or birthday party. They are there to make your party memorable, boasting a spacious floor plan with a touch of sophistication and elegance. Their team will turn your event into a unique gathering with traditional food, delightful drinks and a truly one of a kind Brazilian experience. Click here for more information and contact them to take the hassle out of your holiday planning! RAMW Exclusive Offer: Book your holiday event at The Grill from Ipanema by 10/31 and get a complimentary artisan cheese station for your reception ($450-$700 value) or 20% off your reception package PLUS no rental fee! See website for details. Enjoy CHIKO’s modern Chinese and Korean cuisine without the wait! Now also a fully licensed caterer serving the DC area, let them handle your upcoming luncheon, festive holiday party, or formal dinner to celebrate a milestone and they’ll create everything you need to provide a lasting memory. From dumpling parties, pig roasts, large format feasts, cocktail receptions, and office lunches, CHIKO has you covered! Click here for more details. LINCOLN offers a variety of unique event spaces perfect for private parties, corporate events, holiday parties and beyond with flexibility and seating for 10-180 (full restaurant buyout). Click here for more details and contact Jeanhee Kim at jeanhee@lincolnrestaurant-dc.com to book your event today! With various spaces available for private events from small corporate events, to large scale buyouts, TEDDY is a distinctive restaurant located in Dupont Circle available to accommodate your next event with custom food & beverage menus featuring local ingredients. Click here for more information and contact Jeanhee Kim at jeanhee@lincolnrestaurant-dc.com to book today. Whether you’re planning a casual happy hour party or special event, Declaration Nats Park is a unique location that can accommodate groups of 10-150. Contact today to tailor the space and menu to make your next gathering unforgettable! Click here for more information and contact Jeanhee Kim at jeanhee@lincolnrestaurant-dc.com to book today. MXDC Cocina Mexicana by Todd English, located in downtown DC just steps from the National Mall, is an ideal spot for your holiday party. The MXDC staff is dedicated to creating a memorable and personal experience for you and your guests - bring them your vision and let them take care of the rest! Click here for more information. Smith Commons is a warm, welcoming, and comfortable venue for private events, celebrations, parties, fundraisers and more. Guests are welcomed to reserve/contract any of their available spaces for private dining, corporate happy hours, large celebrations (up to 250 guests), weddings, showers, or fundraisers. Click here for more details and start planning your next celebration today! RAMW Exclusive Offer: Plan your next at Smith Commons and receive 50% off your booking fee for private dining and holiday events booked between 11/23/18 - 1/6/19! Experience the magic of the holidays at Tony & Joe's Seafood Place! With views of the Potomac, their River Room can offer standing room for up to 200 people or a seated dining experience for up to 130 guests. For smaller cocktail events, they have an inside bar overlooking the Washington Harbour fountain that can accommodate up to 50 guests. Click here for more information and book today! With a prime riverfront location, Nick's Riverside Grill is the ideal location for your next event! Whether you are hosting a dinner for 20 people, a private company happy hour, corporate event/seminar, rehearsal dinner, bridal shower or birthday party, they will work with you to tailor your event perfectly. Click here for more information and contact Beatriz Chavez at beatriz@dcseafood.com or (202)367-8430 to start planning. The Dish & Dram’s private dining room along with full restaurant buyout are available for private events. Also a full service catering company, they’ll bring their services to your venue, tailoring menus to your tastes, the season and your budget! Contact Zena Polin at zena@thedailydish.com or by phone for details and booking. Make your next event truly special with a one-of-a-kind private dining experience at City Perch Kitchen + Bar! Enjoy authentic hospitality, seasonal American cuisine and prime location. Click here to contact their event manager to inquire about special rates for private parties and start planning your next event. Grand Cru Wine Bar & Bistro offers a large secluded private dining area serviced from its own bar. Enjoy the quaint atmosphere while experiencing their world class chef crafted cuisine and vast selection of wines and other beverages. Book your event today! Celebrate the holidays at Osteria da Nino! Seating for up to 160 guests or a private room with TV screen and HDMI capabilities that seats up to 50. Choose from their a la carte or family style dinner options with an extensive list of wines! See website for details and book your event today! Located in the heart of historic Old Town Fairfax, Bellissimo Restaurant is the perfect setting for a holiday gathering! Private space available for up to 65 guests, paired with upscale Northern Italian cuisine in a warm and inviting atmosphere – see website for more information. Host your next event at Wildfire! Choose from several semi-private and private dining options that can accommodate 12-120 guests paired with mouthwatering food, exciting atmosphere, and outstanding service. Catering also available – see website for details. 2941 Restaurant offers several spectacular rooms perfect for private parties or corporate events that can accommodate anything from an intimate gathering of 8 to larger private events of up to 100, plus the entire restaurant and outdoor patio are also available for parties of up to 200 - book your next event today! Celebrate the holidays at historic Hamrock’s Restaurant located in Fairfax City from chef-owner Bill Hamrock with private rooms available or the possibility to rent the entire restaurant - see website for details and book today. Inviting and elegant, TRIO Grill is the perfect space for any gathering! With an expert Event Manager to guide you along the way, select tailored prix fixe menus suitable for business dinners, special occasions, private parties, or holiday parties complete with wine pairings and hand-crafted cocktails. See website for details. RAMW Exclusive Offer: Host your next event at TRIO Grill during the month of November and receive a $100 gift card towards future purchase! American bistro with a creative seasonal fare, an active bar scene, and a spacious patio in the heart of Clarendon. CIRCA at Clarendon offers a semi private room in addition to other great options for large parties. Their team will work with you to tailor the space and provide a special menu to meet all your needs – click here for details and contact to book today! Whether you’re planning a casual happy hour or special event - from holiday brunch, baby shower, engagement, birthday, anniversary, corporate happy hour - Open Road Grill has a space for you! They’ll work with you to tailor the space and provide a special menu in order to make your next gathering unforgettable - see website for details.